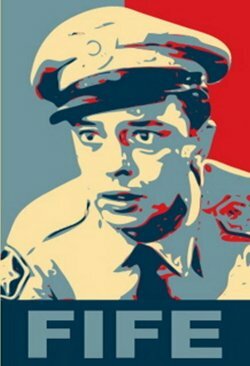 This is a very cool poster of Barney Fife. It is done in the parody style of the famous award winning Barrack Obama Presidential Campaign poster. Has a great retro-yet-modern feel to it. It is 19 inches tall by 13 inches wide. The print is not on paper but a thick, bendable card stock. I have created this myself and am only selling a few prints of the original. Please get one before they're gone.